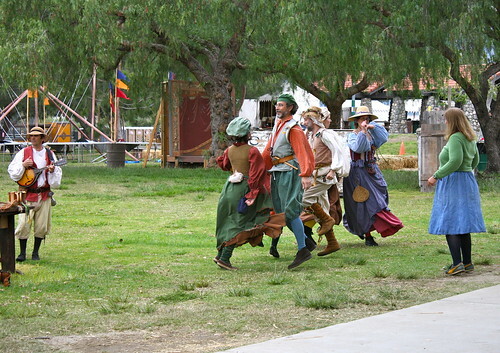 We are one week away from opening weekend at the Southern California Renaissance Faire, or, “The Dam Faire” as we sometimes affectionately call it. Or, not so affectionately, and add an “n”, depending on the situation or circumstances. Heh. The site is a bit behind due to the heavy rains in Southern California over the last two weeks, and so the build continues, a bit frantically. 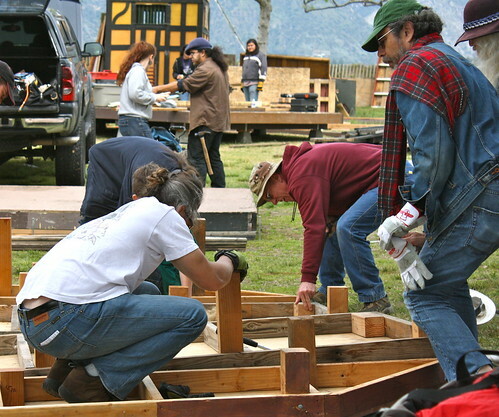 Hard to believe that in just 5 days, this will be an Elizabethan village, but, it will all come together. You can already see it starting to come up, like magic, as I’ve said before. Folk have been hard at work for the last few weeks. We practice going on parade for to take butter to our Queen. 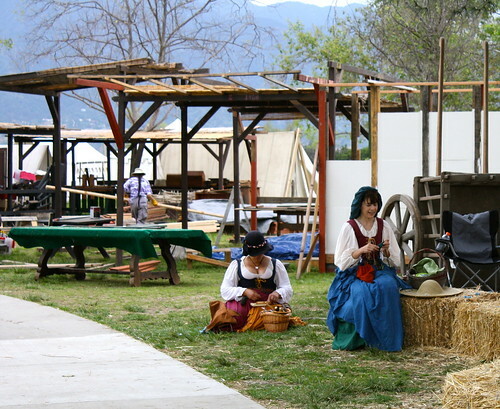 I will be at the Guild of St. Helena’s in the far back of Faire (just past the Trader’s Market, but not quite to where the Celts are camped) most of the time, and I will be there knitting and spinning and teaching these crafts to any who are interested. 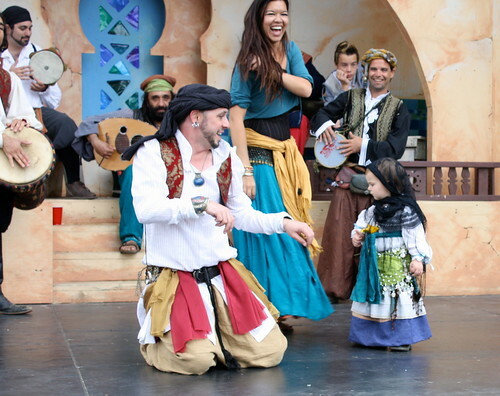 This year is a shift for me, as I am giving up some of the parades and other street acting that I so enjoy doing. I am finding that I have less spoons than I have had in years past and so I plan to strategize and conserve my energy to get the most out of the run. And, you know, to have energy left during the week so I can run Honey&Ollie! Oh you’ll probably still see me in a sheep’s hat during Sheep Parade, and I’ll be down at the front gate in the mornings, with my shepherd’s crook, looking for my lost little sheep Buttercup. I love those gigs too much to ever give them up. But I’ll probably stick closer to home during the rest of the day. 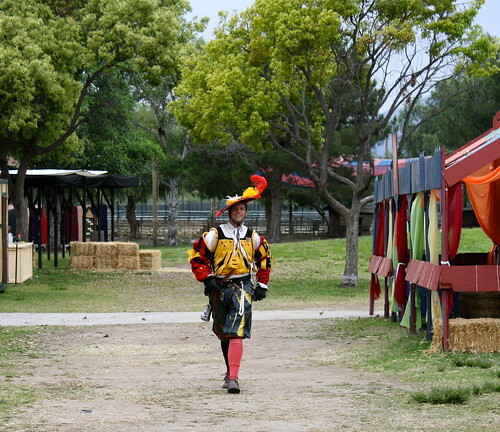 If you’re anywhere in Southern California, come out to the Faire in Irwindale, and come say hi. 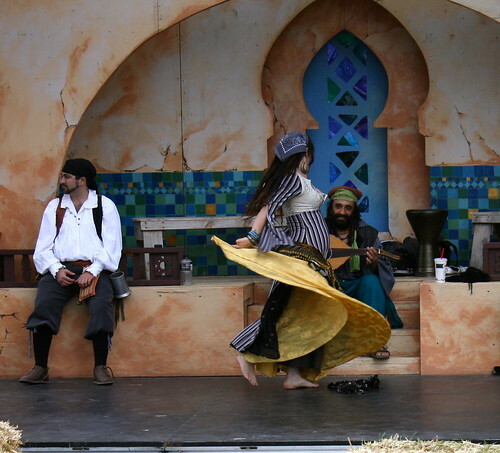 The glove is up next Saturday, the Faire will be open to all, and we would love to see you within our shire! 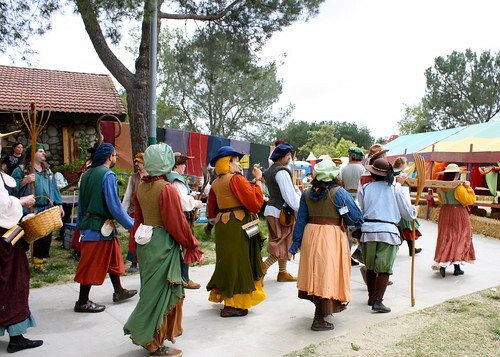 This entry was posted in faire. Bookmark the permalink. 7 Responses to We are so close! 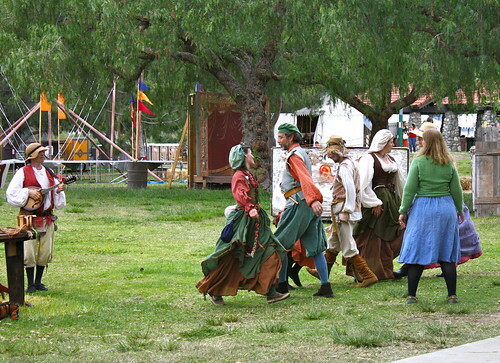 Oh, the Faire! I used to go every year to the one we have in the IE. Have fun! It’s the same Faire! We got kicked out of Devore, and moved to Irwindale. I always used to go on opening weekend, because chances are good that was the coolest weather of the run. LOLOL. Have fun! I’d love to go “visit”, but this year there’s no time or money for it. *sigh* Next year, though. Have fun! Aw! Next year for sure! Oh, this does sound like a grand time in the offing! I wish the streaking black bullet passing sorta-near could stop for a while at the end of this month, but with a kitty in the back….and much, much too little money and time to spend… I think I’ll have to miss again…. But the future is never set, and our fate is what we make, so I may someday have the chance to visit. May the sun shine ever softly upon the Shire, may dances be light, laughter be plenty, and the beltpurses filled to brimming! Thank you! I hope one day things align so you can visit as well! 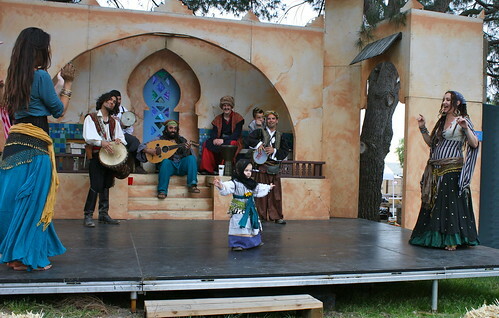 Great pictures and good luck with the faire.